WataugaWatch: Gov. Squishy: "Yes, I Will Not Lead"
"Rather, it sounded like McCrory, a Republican, wants to find a way to avoid a potential showdown with social conservatives in his own party and abortion rights advocates. He said he wants the House, which is next in line to review the bill Tuesday, to look at current clinic rules to see if they're reasonable and being enforced.
" 'There's a fine line between safety measures and restrictions, but those two lines should not be confused and I'm very concerned about the responsibility to ensure the health of women is protected,' the governor told reporters." 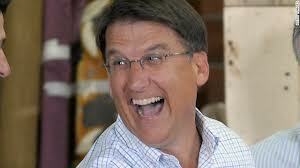 Poor McCrory! So many "lines"! So confusing! Which lines is he supposed to toe? Which lines must he not cross? And, in fact, which lines has he already gotten crossed? For example, in the press conference yesterday, he blamed President Obama for the ending of unemployment benefits for some 70,000 North Carolinians, while we distinctly remember that it was McCrory himself who signed that bill.